StarCraft is a really, really successful PC real-time strategy game from Blizzard Entertainment. It is ridiculously popular in Korea, even holding offline tournament matches for it, and had a nice Nintendo 64 port developed by Mass Media, the only time any game in the series would appear on a console. What's odd is that the sequel, StarCraft II, took 12 years to be released. Then again, considering Blizzard's track record of developing and re-developing games for more than a decade, this is not surprising. Find a copy of the Battle.net Beta and try to get access to the .dat files. They contain some of the most critical information we need to figuring out what else is in there data-wise. How many audio files are out there, Dukie? These missions are unused in the final version of the game. This mission would have occurred just after Norad II, Misson 6, but before The Trump Card. This mission explains why Tassadar began to assist Jim Raynor. The player controls General Duke in a Siege Tank and Raynor in a Vulture, along with 4 SCVs and a Command Center. This is odd, since General Duke only appears in a Siege Tank in the precursor missions and the StarCraft demo. The mission is incomplete; among many other issues; Tassadar does not appear without modification due to a non-functioning trigger. Strangely, The Trump Card is called Mission 7, but this is also called Mission 7. This probably means that this was considered the seventh mission, but got replaced by The Trump Card instead. This map was redone for the Enslavers Campaign, but with altered terrain, enemies, locations and story. This mission would have occurred after The Big Push, Mission 8, but before New Gettysburg, Mission 9. The player commands Jim Raynor and Sarah Kerrigan, along with a small strike force made up of every Terran unit in the game except for the SCV. This mission would have been the final strike against the Confederacy, but it was scrapped, creating a plot hole. Oddly, this is called mission ten, but it comes before mission 9. Perhaps New Gettysburg was mission 10 before Operation: Silent Scream got scrapped? This map was also refined for the Enslavers Campaign along the same lines as "terran7". This may originally have been the tutorial for the Protoss Campaign. The gameplay is similar to that of the campaign's first mission, but the layout of the player's base is different, and Fenix has different dialogue in which he mentions a race called the Tagal, a race that is weak individually but deadly in large numbers like the Zerg, while defending Antioch. Most likely, this building would have been used to repair mechanical units. It may have been from a point in time where they planned to use it to repair mechanical units instead of using SCVs, as seen in the retail version. The UED flagship Battlecruiser Aleksander piloted by Gerard DuGalle. He uses Edmund Duke's voice overs but retains his portrait. The Terran Dominion flagship Battlecruiser Leviathan, piloted by Arcturus Mengsk. Once again, Duke's voiceovers are used but Mengsk retains his portrait. His unit lacks a wireframe. Aldaris was originally intended to be a unit. However, his actual unit goes unused, even in the Brood War mission "The Insurgent". In said mission, Tassadar's unit is used instead but through some clever use of triggers, it's made to look like it's actually Aldaris (this is actually used for a number of "non-existant heroes" in Brood War, such as Raszagal. This illusion can easily be seen if the player selects them before the mission ends). Tassadar and Aldaris share stats so if one is modified the other is affected as well. Like Tassadar, Aldaris has an attack but unlike Tassadar he has no abilities and lacks voiceovers. Raszagal is probably the most incomplete unit. Although she exists as a unit, she uses the Corsair's sprites but is much weaker and has a Dark Templar unit's wireframe. She uses the same weapon as the Corsair. Can we convert .smk to .png? Hidden inside the game files are many units that are all listed as "Independent Buildings", "Independent Units", or "Independent Heroes". These suggest that there may have been a fourth race in development, which may not have even been able to be controlled by the player. It's possible that it only showed up in the campaign and/or custom maps. They even have their own Advisor listed in the game: "NAdvisor". While this does appear on certain buildings, there is actually a fully rendered portrait for it. It does not appear on said buildings because the listing points towards the standard Marine portrait instead. The portrait itself is the Terran Science Vessel, hinting that originally he would have been their Advisor. The Civilian is also listed here as well, hinting that he also may have once been an Independent Unit before being made a Terran Hero instead. Also, if one opens any map or creates a new map in SCMDraft 2 (an unofficial StarCraft map editor), when looking at the options for players 'Independent' is listed there in the Race selection for every player. This is probably the most concrete evidence supporting the fact there was originally a fourth race in development. Gunships were once Terran vessels meant to be used in conjunction with capital ships, such as the Battlecruiser. Small, dynamic, high-speed fighters such as the Wraith were developed instead. However, it was found that the Wraith could deal out a similar amount of damage to capital ships while evading most defensive battery attacks. After that, the Gunship became only used by the cut race "Independents" as they used the old outdated Terran technology. There was one Gunship hero unit known as Greedo, which is a reference to the Star Wars character. Not much is known about the Cargo Ship. One hero named Sally was intended to be for the Cargo Ship. The Cargo Ship is rumored to be the original Battlecruiser. It's possible that this unit was the Terran's Battlecruiser, until they made a more powerful version. The developers made the Independents use the remaining obsolete versions instead. An Independent unit of unclear purpose. Two hero Raiders, Boskk, another Star Wars reference, and Peter had been created for this unit. Its .grp was altered and turned into the Terran Valkyrie for StarCraft: Brood War. It's also notably bigger than the Valkyrie as well. The Merc Biker has a portrait which exists in the retail release, but it's only made up of the same still image repeated. What the unit itself would have looked like is currently unknown. A character named Grom was intended to be a Merc Biker hero, but didn't make the cut. This name was later included in WC3. A closer look into the data reveals that a Vulture wireframe is near the Cargo Ship's, Raider's, and Merc Biker's wireframes. An Independent structure that was cut from the final version. There is a name mix-up in the game files; it is listed as Independent Starport in DatEdit, but the picture in neutral is listed as "starbase.grp". The picture is definitely for this unit. In-game, the Starbase has the appearance of a Scout, thanks to the mix-up up above, but with a very large placement circle. It has the portrait of a Marine (NAdvisor as listed in DatEdit) and an undefined, non-functional weapon. Graphics for the Starbase can be found in the game files. It is located under the "Neutral" files, alongside the other Campaign-only buildings, suggesting it was for a Campaign mission. It is likely that the Independents would have used this to construct Raiders, Cargo Ships, and Gunships. An Independent structure that was cut during development. Its purpose is unknown, though it may have been used to construct Merc Bikers. It uses the portrait of a Marine (NAdvisor as listed in DatEdit). It's clear this was not a Terran building. This unit will crash StarCraft if viewed in-game, thanks to it missing an image file and coding. It is an Independent version of the Terran Command Center with a different appearance. It is unclear whether or not the actual .grp for the unit still exists somewhere. It most likely would have been used as the Independent's resource gathering building. It uses the portrait of a Marine (NAdvisor as listed in DatEdit). This unit will crash StarCraft if viewed in-game, thanks to it missing an image file and coding. The Jump Gate may have been the Independent version of the Protoss' Warp Gate. It uses the portrait of a Marine (NAdvisor as listed in DatEdit). It could've been an automated, unit-less way of mining for the Independents. It's unlikely that it was a Doodad, due to it being listed as a unit. 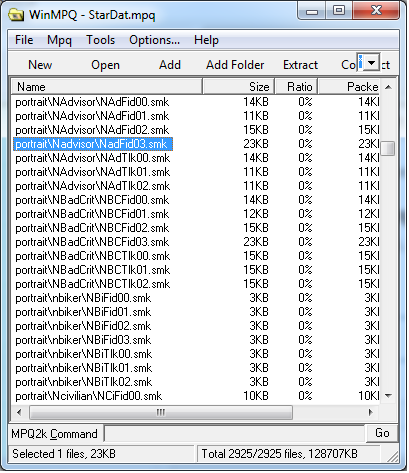 It also uses the portrait of a Marine (NAdvisor as listed in DatEdit) making it clear it was not a Terran building. This unit seems to be a power plant. What use of it is unknown, though it may have functioned like the Protoss pylon. The Zerg Devourer unit originally had a different cocoon. In the final game, it uses the same Cocoon graphic as the Zerg Guardian. The old Cocoon is stored alongside the rest of the Devourer birth graphics. Unused unit wireframes for the Cargo Ship, the Raider, and the Repair Bay building can still be found in the original game's files. There is a flag that is inaccessible from the default map editor, but is used in some multiplayer maps. This can be spawned in-game using triggers, but will crash the game when clicked. 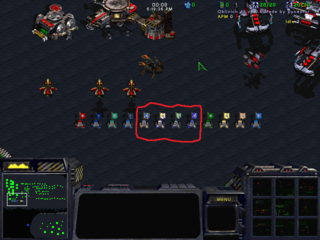 Uniquely among units, the flag uses a different portrait for each player to determine the color of the flag seen on the portrait. Looking at the portdata.dat file from BrooDat.mpq shows that there are the standard 8 flag color portraits from 82 to 89, but at 106 to 109, there is additional flag portrait data for Players 9 to 12 (9 being Green, 10 being Bright Yellow, 11 being Tan, and 12 being "Blue", which is actually Light Blue, the color used by Neutral/World). 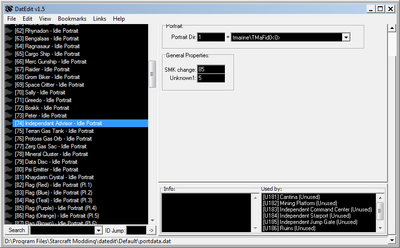 It is unknown what portdata.dat in StarDat.mpq, but portdata.tbl only shows lines for Flag1 to Flag8. Looking inside StarDat.mpq in portraits with a proper listfile shows there are no portraits for 9 to 12; looking in BrooDat.mpq shows that they were added in 'Brood War. This doesn't show much related to the problem, but that is because only looking at the data does not show everything: SCMDraft 2 is the key. If you load up SCMDraft 2 and look at the Map Properties when you open or create any map, you will see the standard 8 player slots, as well as 4 extra player slots that are missing the option to change color; the latter do not work properly and are useless as player slots. What you must be asking yourself is, "What does all this mean?" If you look at the color options you will see not 8 nor 12 but 17 colors that you can choose from, with Dark Aqua, Pale Green, Bluish Grey, Pale Yellow, and Cyan being added. What this is all pointing to is very clear. StarCraft was intended for 8-player multiplayer given that most multiplayer and skirmish maps only go up to 8 player slots, but Brood War was going to add at least 3 new Player slots (Player 9-11) and 1 Neutral slot (Player 12). While there are maps (in Brood War) in which you can play 11 players, players 9 to 11 currently only act as Computer slots, meaning that they only have the Owner and Race selections, which don't seem to change anything, and that they are unable to count as actual slots in-game; the game still will only show 8, so human players can never occupy those slots. They seem to act as hostile computers, but further investigation is needed to see if there is anything different about them. They are set to "Unused, Inactive" by default. Player 12 exists exactly as it should, since it is a Neutral slot, and instead of being set to "Unused, Inactive" it is set to "Unused, Neutral" by default to act as the controller of resource units. The five extra selectable colors point towards Blizzard planning to have 16 player slots (Player 1 to 16) and 1 neutral slot (Player 17). The cause of the crashes are four of those extra colors. Choosing them as a player color for any player causes you to use one of 4 strange color palettes that do not have proper flag portraits, so clicking on their flag causes the game to crash because Flag13 to Flag17 don't exist anywhere in the .mpqs, and the data that would link the flag to the appropriate portrait (Flag13-17) more than likely doesn't exist either. However, Dark Aqua acts as Light Blue (what Portdata refers to as "Blue") and will not crash the game when it is used as a player color and its flag is clicked on. Oddly, though, SCMDraft2 displays their palettes exactly as they should look. Every campaign mission includes a title and description that were left unused (The mission names come from a different file). Tutorial: Boot Camp Terran Tutorial A very simple walk-through. Desperate Alliance T3) Desperate Alliance Besieged by the Zerg, you reluctantly agree to be rescued by the terrorist group called the "Sons of Korhal". The Jacobs Installation Untitled Scenario Destroy all enemy buildings. Revolution T5) The Antigan Revolt Secret Staging Area, Second moon of Antiga Prime. Norad II T6) New Year's Day Duke crash lands near an Antigan settlement. Mengsk orders Raynor and Kerrigan to save him. The Trump Card T8) The Trump Card The Secret Base has been surrounded by the Confederates. You must use the Zerg against the Confederate forces to break the siege. The Big Push The Big Push Eliminate all Confederate Forces. New Gettysberg T11) New Gettysburg Destroy all enemy buildings. The Hammer Falls T12) The Hammer Falls Destroy the giant Ion Cannon. Unused Tutorial Untitled Scenario Destroy all enemy buildings. Among the Ruins Z1) Among the Ruins Wipe out any Terrans who pose a threat to the Chrysalis. Egression Z2) Egression Move the Chrysalis to the launch area. The New Dominion staredit\wav\Z3B00zad.wav - Protect the Chrysalis. Agent of the Swarm Z4) Agent of the Swarm Take care of the Chrysalis. The Amerigo Assimilation Shane's mom. The Dark Templar Z6) The Dark Templar Kerrigan discovers that the Protoss have been hiding on Char for some time. The Culling Z7) The Culling While you were distracted by Tassadar, he slew Zasz - sending the Garm Brood into an uncontrolled rampage. You must destroy the Garm Brood. Eye for an Eye Z8) The Dark Templar You must destroy the Dark Templar who've made you look like such a ninny. The Invasion of Aiur Z9) The Invasion of Aiur Now that your here, the Overmind says you've got to do some wacky stuff before he can manifest himself. Full Circle Untitled Scenario Destroy all enemy buildings. Unused Tutorial P1) First Strike Save Antioch! First Strike P1) First Strike Save Antioch! Into the Flames P2) Into the Flames Congratulations from Aldaris are interrupted by a surprise message from the exile Tassadar: Destroy the Cerebrates and the Zerg will fall. Higher Ground P3) Higher Ground Since the Cerebrate reincarnated, Aldaris suggests a more traditional approach: Kill them all! The Hunt for Tassadar P4) The Hunt for Tassadar Now that things seem well at home, the Conclave sends you to Char to arrest Tassadar and bring him back to Aiur. Choosing Sides P5) Choosing Sides Tassadar and Aldaris argue bitterly. Tassadar convinces you to help him rescue Zeratul before returning to Aiur. Into the Darkness Protoss 06 Rescue Zeratul. Homeland P7) Homeland Upon your return to Aiur, you are greeted by Praetor Fenix - now a Dragoon - who let's you know you must hide Zeratul to protect him from the Conclave. The Trial of Tassadar P8) The Trial of Tassadar Zeratul has abandoned you. Fenix believes rescuing Tassadar is now your only hope. Shadow Hunters P9) Shadow Hunters Now that's everyone's together, it's time to take out the Zerg. Eye of the Storm Untitled Scenario Destroy all enemy buildings. "terran 3" (Desperate Alliance) This level has two disabled triggers. The first would have played an unused transmission when a Zerg building was killed before the last two minutes of the level. If you then go and kill the Zerg hatchery, the second trigger will spawn Dropships in another location and the level will end as a victory. - Colonial Militia kills at least 1 buildings. - Countdown timer is at least 120 game seconds. - Mute all non-trigger unit sounds for current player. - Send transmission to current player from Terran Command Center at 'Anywhere'. Modify transmission duration: Subtract 0 milliseconds. defenses and reach Mengsk's transports. - Unmute all non-trigger unit sounds for current player. - Wait for 2000 milliseconds. - Zerg Swarm commands at most 0 Zerg Hatchery. - 'Switch 2' is set. - Countdown timer is at least 1 game seconds. - Send transmission to current player from Terran Command Center at 'Attack Drop(1)'. We've broken through to the dropships. - Create 1 Terran Dropship at 'Attack Drop(1)' for Sons of Korhal. - Create 1 Terran Dropship at 'Attack Drop(2)' for Sons of Korhal. - Create 1 Terran Dropship at 'Attack Drop(3)' for Sons of Korhal. - Create 1 Terran Dropship at 'Attack Drop(4)' for Sons of Korhal. - Create 1 Terran Dropship at 'Attack Drop(5)' for Sons of Korhal. - Create 1 Map Revealer at 'Attack Drop(1)' for Colonial Militia. - Wait for 500 milliseconds. - Center view for current player at 'Attack Drop(1)'. - Send transmission to current player from Terran Dropship at 'Attack Drop(1)'. - Wait for 3000 milliseconds. - End scenario in victory for current player. A trigger is disabled early in the game. - Elapsed scenario time is at least 1 game seconds. - Current player commands at least 1 men. - Send transmission to current player from Jim Raynor (Vulture) at 'Anywhere'. "protoss 6" (Into the Darkness) The mission briefing has a lot of unused content. Raynor was supposed to be included as Tassadar reaffirmed his commitment to recovering the Dark Templar. This scene may have been removed since Kerrigan does not appear during the mission. This cut section of the briefing does appear in the StarCraft 64 version of the mission, albeit without the audio. - Show portrait of Jim Raynor (Marine) in slot Slot 3. - Pause for 1000 milliseconds. - Show speaking animation for Slot 3. - Show speaking animation for Slot 4.
you must know that I will not hesitate to destroy her should she pose a threat to us. Nothing shall prevent me from delivering the Dark Templar to Aiur. - Hide portrait in slot Slot 3. "terran tutorial" (Boot Camp) Switch 2 is never set in-game, leaving this trigger unused. - 'Switch 1' is set. - 'Switch 7' is cleared. - Create 1 Map Revealer at 'Minerals' for Player 2. - Send transmission to current player from Terran Barracks at 'Anywhere'. Modify transmission duration: Subtract 100 milliseconds. - Kill all Map Revealer for Player 2. This page was last modified on 6 April 2019, at 11:54.